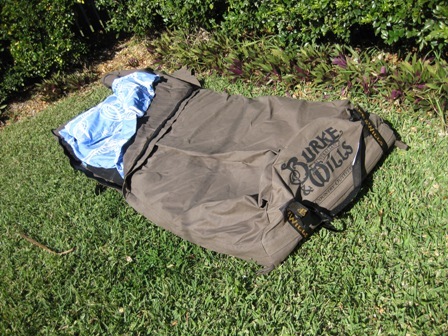 After using a traditional swag and enjoying how comfortable it was, I decided to purchase a Burke & Wills Ironbark swag to add to my camping kit. There are a few reasons for this. 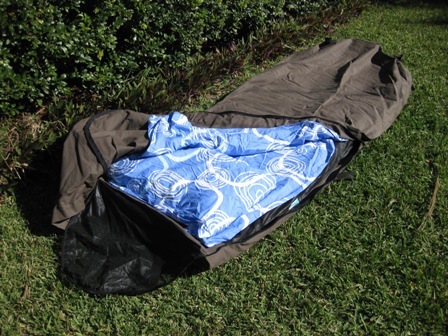 Firstly, I think that a swag is a more practical solution to self-inflating air mattresses (the big ones can be time consuming to roll up and are still bulky) and sleeping bag (sleeping bags are not easily washable; a doona stuffed inside a swag is). Secondly, my home made traditional swag was so comfortable, I wanted a second one that was insect proof. Finally, I just like the idea of saying that I am rolling out my swag at the end of the day. I have been sleeping traditional swag style intermittently during the last few months when my wife has had the winter lurgy (who wants to be in bed next to someone coughing and sniffling?) I laid a canvas tarp on the floor, put a DMH 4WD Offroad self-inflating mattress on it, laid a queen-sized doona and pillow on it, then folded the donna and tarp over me. I did this in our living room, with no heating in the middle of winter. I have been so toasty warm that I have been looking for excuses to get back into it! When it has been really cold I have pulled the tarp over my head shaping a tunnel to give me fresh air. And the joy of pulling back the tarp in the morning and looking up to beautiful blue sky outside our massive window has been very pleasant. Now to pick a fight with the missus so that she throws me out of the bedroom and I can sleep in my swag again! Swags are significantly warmer than tenting it with a sleeping bag. I suspect this is because, with the head covered, the heat from your breath is re-circulated, although this can lead to condensation issues. Many people when using a tent still use their swags inside their tents. That is my plan, as well as laying it out around the camp fire some nights when the kids are in the tent. An internet scan suggests there are a number of good brands on the market. Without doing a feature-by-feature comparison, decent brands seem to be (in alphabetical order) AOS Swags & Bags, Burke & Wills, Bushskins, Darche Outdoor Gear, Down Under Swags, Jolly Swags, Mr Swagman, Onland Australia, Saul Swags, and True Blue Swags. Oztrail swags, particularly the value-for-money Mitchell, seem to be widely used too. I wanted a traditional swag because I planned to use mine in a tent sometimes, which would mean that I could not tie it up, nor hammer pegs through the tent floor. Accepting that the above named brands were all decent, I looked for the features that I wanted – size around 200 cm x 80 cm (a good size for in the tent, but able to fit me in comfortably) and fully screened for those times when I did set up around the camp fire or on the beach. I was quite surprised just how many were not screened and open to Australia’s fauna joining you in bed. I eventually decided on a Burke & Wills Ironbark swag. The size was 210 cm x 80 cm with sand-fly mesh at the head end and a sizeable head flap. I liked the 15 oz canvas, cover over the entire 75 mm convoluted mattress (some only cover the top of the mattress), and zip from the foot right up over the head fly-screen. To top it all off I was able to choose a colour – my preferred colour was brown (most come in various shades of green), but I suspect that when I get my wife one it will be pink! I purchased my Burke & Wills Ironbark swag from Wild Earth on eBay. I was the only bidder at auction and I purchased it for $224 + $7.95 freight. Bargain. It arrived two days later. Talk about quick! The Burke & Wills Ironbark swag was packed in a box and vacuum sealed in a plastic bag. The plastic bag shrinks the packed size by about half making them much easier to freight. I rolled out the Burke & Wills Ironbark swag and hopped in, zipping it up. There was plenty of height in the head area and I was able to prop the canvas off my head without having to tie it up. The 75 mm convoluted mattress was confortable too. I have a doona cover folded in half lengthways in my swag – a queen size seems to fit quite well, but a double size, while the right size laying flat, does not wrap sufficiently around me. Perhaps I am too fat? Anyway, my old woollen queen-sized doona fits well and will keep me very warm. 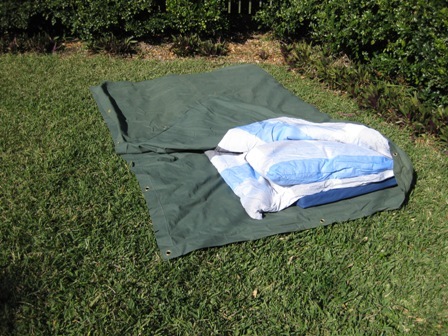 Using the doona fitted with a quilt cover means that I am able to easily remove it to wash and air – washing is much more difficult with a sleeping bag. It also means that I am sleeping wrapped in a pure cotton cover top and bottom. I have a full-size pillow in my Burke & Wills Ironbark swag. Who said sleeping in a swag is roughing it?!? 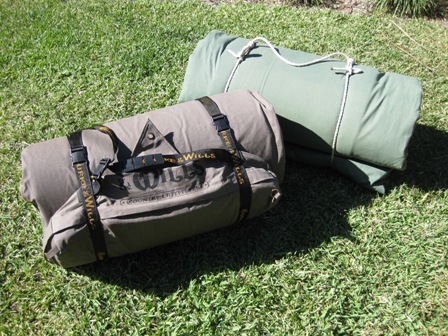 I think my Burke & Wills Ironbark swag is quickly going to become my favourite piece of camping kit. This entry was posted in Gear and tagged Camping, Canvas, Review, Swag, Swag Photos, Swag Pictures on 6 August 2010 by Rex.